Whether visiting Newman Brothers at the Coffin Works by foot, bicycle, public transport, by canal or by car, the information below will help you find us. We are only a short walk from both the Library of Birmingham and Birmingham Museum & Art Gallery. You can find us on the other side of the Ring Road, please use the crossings and take care as the road is busy. We have bike racks in the Courtyard. Our nearest train stations are New Street and Snow Hill. The Jewellery Quarter metro is a little bit further away. 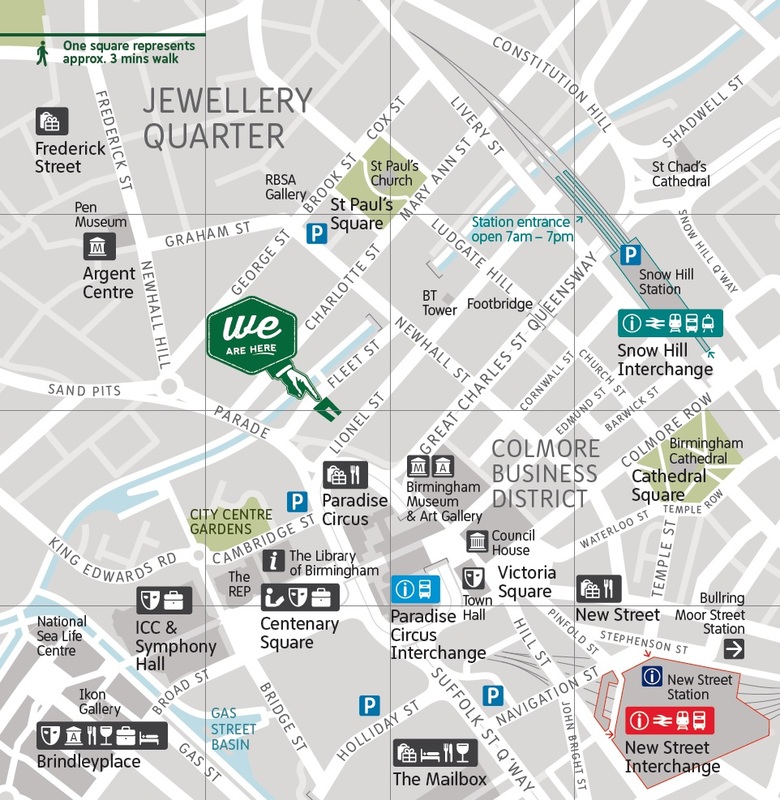 We are a 10-minute walk from Birmingham New Street. Visitors should follow signs for Birmingham Museum and Art Gallery (BMAG) and cross over at Great Charles Street Queensway, a dual carriageway located at the rear of BMAG. From there, head straight on, which will bring you on to Newhall Street. Carry on walking for around 50 metres and Fleet Street is the second road on the left. Newman Brothers is located at the top end of the road. Keep an eye out for the ‘MUSEUM’ banner and hanging sign. If travelling from Snow Hill Station, this is roughly another 10-minute walk. Leave the station and turn right on to Colmore Row. Head down that road for approximately 300 metres until you reach traffic lights, where you’ll also find Pret a Manger located on the right. Cross over on to Newhall Street and turn right. Head down Newhall Street until you reach Great Charles Street Queensway. From there, head straight on, continuing along Newhall Street. Carry on walking for around 50 metres and Fleet Street is the second road on the left. Newman Brothers is located at the top end of the road. Keep an eye out for the ‘MUSEUM’ banner and hanging sign. 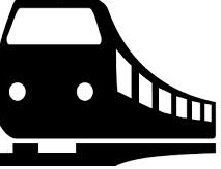 Looking for cheap train tickets? Click here to see railcards, fare finder and special offers. Please be aware, due to the Paradise development, there will be a series of road diversions in place which will have an affect on Fleet Street where we are based. Please leave yourself a little bit of extra travel time! Leave the M6 at junction 6 and follow signs for City Centre (A38). After approximately 2 miles the road becomes elevated. Keep following the A38 and go under the tunnel (St Chad’s Circus Queensway) keeping in the left-hand lane. As you emerge from the tunnel, filter left following signs for The International Convention Centre i.e. re-joining the main dual carriageway. DO NOT GO UNDER THE NEXT TUNNEL. Continue along Great Charles Street, stay in the right hand lane and follow the road around to the right into Summer Row. Go straight at the traffic lights, continuing down the hill to the traffic island by the BMW garage, where you will turn 360 degrees. When returning up the hill, Fleet Street is the second left. You will find us about 20 metres down on the right). Fleet Street is a one-way street. Driving to the Coffin Works from BirminghamCT/Garbi on Vimeo. Take the junction 3 exit from the M5 and follow sign A456 to Birmingham West and Central. After approximately 5.5 miles you will pass the Plough and Harrow hotel on your left – get into the right-hand lane and continue along A456 through the underpass. You will emerge into Broad Street. Shortly after passing the International Convention Centre (on left), follow signs for The North M6 at island into Great Charles Street. Take first left (traffic lights) into Newhall Street and first left (traffic lights) into Lionel Street. Continue to the end of the street and turn right at the Shakespeare Pub. Follow the road round to the right into Fleet Street (Fleet Street Kitchen at top of hill). You will find us about 20 metres down on the right). Fleet Street is a one-way street. There is on-street parking (2 hours no return) available on Fleet Street at a cost of £1.90. In surrounding streets there is a 4 hour stay. Please be aware that the side of the street along the canal is for Permit Holders only – you will get a ticket! On-street parking is FREE after 6pm, on Sundays and on bank holidays. The nearest off-road parking is Paradise Circus Car Park. In addition, there is additional off-road parking located at the NCP on Newhall Street. There are two Disabled parking bays for Blue Badge holders located on Fleet Street, to the right of the main entrance to Newman Brothers. For more information about disabled access to the museum, click here. There is a Coach parking bay in Fleet Street, almost opposite Newman Brothers at the Coffin Works, which is a drop-off zone only (driver must stay with vehicle). The closest Coach and Lorry Car Park is on Brewery Street. Please note: during the roadworks near to us some of the bus routes may have altered temporarily. Please check before travelling. From the town centre you can catch the 87/89 services on Colmore Row by St Philips Cathedral. Get off on Great Charles Street Queensway. Cross over at the lights, and walk down Summer Row, Fleet Street is the second road on the right. You will walk past UCB and The Shakespeare pub (which is on the corner of Lionel Street). The museum is not far from the top of Fleet Street on the right hand side. Keep an eye out for the ‘MUSEUM’ banner and hanging sign. Remember – this distance is covered by the £1 fare. Services 8A and 8C (Inner Circle) and 101 from Birmingham City Centre (Colmore Row) and Handsworth serve the Warstone Lane clock in the heart of the Jewellery Quarter (10 minute walk to Newman Brothers). Services 16 and 74 run along Constitution Hill and Great Hampton Street stopping close to Vyse Street (20 minute walk to Newman Brothers). We recommend that you check bus times before travel. We also have a special offer – £1.50 off adult admissions at The Coffin Works when you travel by National Express Bus. Please complete the form here before you travel to take advantage of this discount! We are 6 mins walk along the towpath from Cambrian Wharf where there’s 2 days or 14 days mooring available. The closest bridge to the Coffin Works is Islington Place Bridge, which is next to Farmers Bridge Lock 6.